Golden yellow, white-stalked, one or two in each axil of leaves near the ends of branches. Tas. endemic. 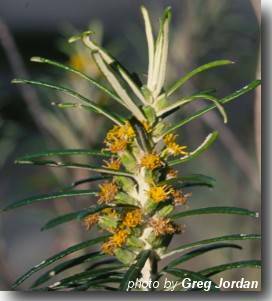 Widespread in wet eucalypt forests and on well drained rocky hillsides, on the central plateau, in the islands of Bass Strait and in S.E. Tasmania. Intergrades with B salicina on drier rocky slopes on dolerite. Seed handling involves breaking up seedheads, winnowing and sieving. Seed has low viability and should be sown thickly and lightly covered. Very difficult to propagate from cuttings.